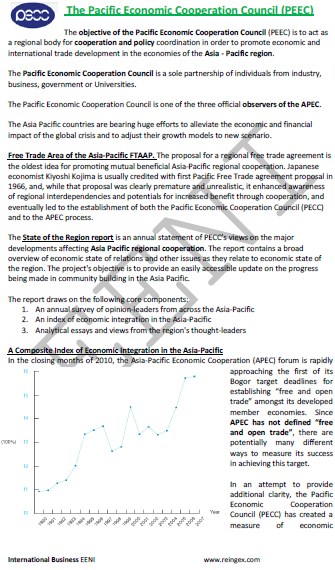 Syllabus of the Online Course (Subject): Asia-Pacific Economic Cooperation (APEC). Description of the Online Course: Asia-Pacific Economic Cooperation (APEC). The Asia-Pacific Economic Cooperation (APEC) has twenty-one members, representing 41% of the World population, 57% of the World's GDP and 44% of global trade. The member economies of the Asia-Pacific Economic Cooperation (APEC) are Australia, Brunei Darussalam, Canada, Chile, the People's Republic of China, Hong Kong, Indonesia, Japan, the Republic of Korea, Malaysia, Mexico, New Zealand, Papua New Guinea, Peru, the Philippines, the Russian Federation, Singapore, the Chinese Taipei (Taiwan), Thailand, the United States of America, and Vietnam. The Asia-Pacific Economic Cooperation is a forum for assisting economic growth, cooperation, International Trade, and foreign direct investment in the Asia-Pacific region. The Asia-Pacific Economic Cooperation (APEC) has worked to reduce tariffs and other trade barriers across the Asia-Pacific region, creating efficient national economies and considerably increasing international trade. The pillars of the Asia-Pacific Economic Cooperation are the Bogor Goals of free and open foreign trade and foreign direct investment (FDI) in the Asia-Pacific region by 2010 for industrialised economies and 2020 for developing economies. These objectives were adopted by the APEC Leaders in 1994 in Bogor (Indonesia). 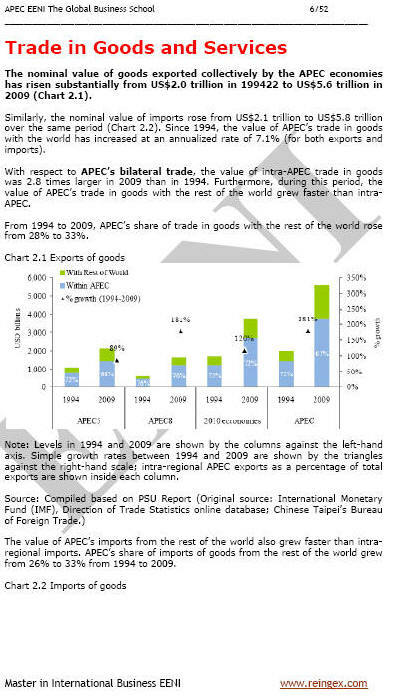 As a consequence, the intra-APEC trade of products (exports and imports) has grown from USD 1.7 trillion in 1989 to USD 8.44 trillion - an average increase of 8.5% per year; and international trade in goods within the region accounted for 67% of total external trade of the APEC products. 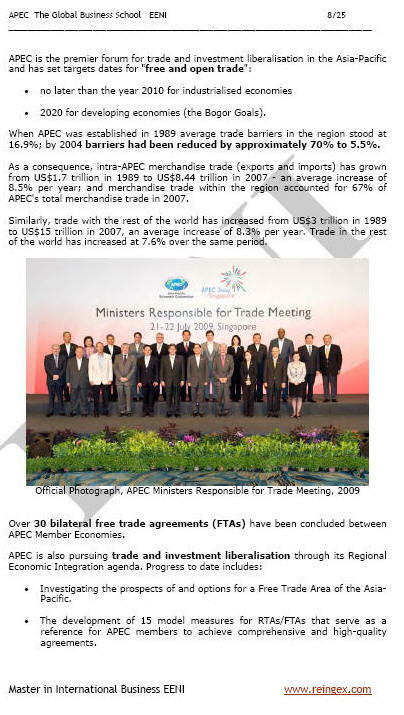 Above thirty bilateral Free Trade Agreements have been finished between APEC member economies. As a result of the APEC Trade Facilitation Action Plan, the cost of international business transactions across the region was reduced by 5%. The Asia-Pacific Economic Cooperation (APEC) is an inter-civilisation agreement between Western Christian Civilisation, Sinic - Buddhist, Orthodox and Islamic Civilisation.